Marty clearly learned from his experience in 1955 not to try to order anything other than the advertised beverages. Pepsi Free? Tab? 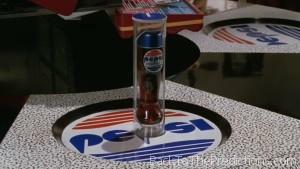 Nope, just a Pepsi. The Cafe 80’s provided him with a bottle of Pepsi Perfect. Pepsi Perfect is apparently a vitamin-enriched version of Pepsi. Since 1985, PepsiCo has released dozens of varieties of Pepsi (including the infamous Crystal Pepsi variety). The closest we’ve seen to a vitamin-enriched version is Pepsi Natural. Available between 2009 and 2011, it contained naturally sourced ingredients with no artificial flavor, color, preservatives, or sweeteners. Not exactly “vitamin-enriched”, but all-natural. Maybe PepsiCo will introduce “Pepsi Perfect” by October, but there’s no sign of that yet in our 2015.